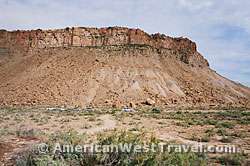 The Ute Mountain Tribal Park in southwestern Colorado was created to preserve significant remnants of the Ancestral Pueblo (Anasazi) people, including spectacular cliff dwellings and rock art. Access to the park which is along the Mancos River and tributary canyons – and adjacent to Mesa Verde National Park – is by guided tour only. 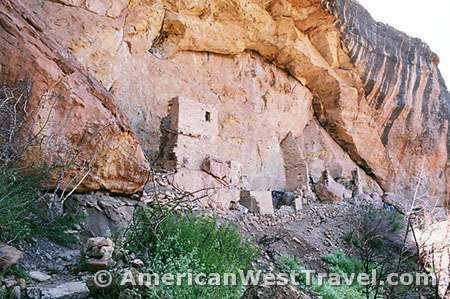 The morning segment of the tour, covered in “Spectacular Anasazi Cliff Dwellings and Rock Art, Ute Mountain Tribal Park” (Part 1 of this article), made stops at ruins and rock art sites in Mancos River Canyon. 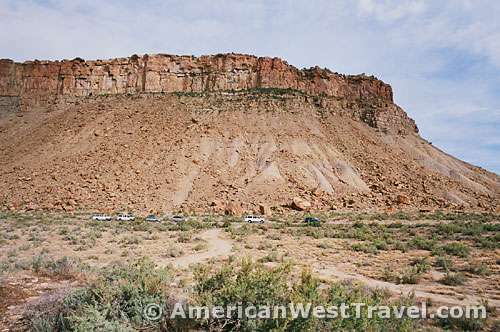 The tour then exits the canyon, veers around Johnson Canyon, and reaches the mesa top at the head of Lion Canyon. The Anasazi built their cliff dwellings beneath overhangs and in shallow caves within the solid rock layer just below the top of the mesa. The photo, right, shows a typical Mancos Canyon mesa: the rock layer at the top is quite apparent. It is also obvious that the only practical access to dwellings placed there would be a tedious climb down from the mesa top. The Ancestral Pueblo inhabitants of Johnson and Lion Canyons lived on the adjacent mesa tops prior to the construction of the cliff dwellings (pottery shards can be seen on the top near the trailhead). The first phase of construction in the rock overhangs took place from 1130 to 1160. A second and final phase took place from 1195 to 1240 CE. 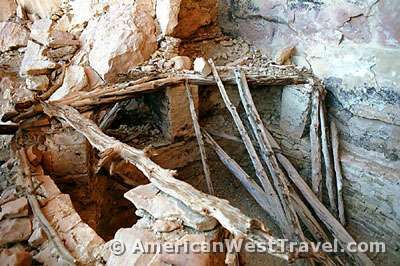 It is thought that the cliff dwellings were at least partially abandoned between these periods, as the second phase work involved some apparent dismantling of the earlier construction. 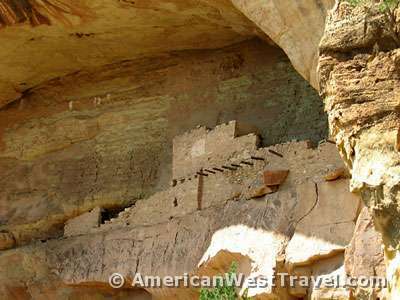 Final abandonment took place around 1250 CE, thirty or forty years before the Mesa Verde cliff dwellings were thought abandoned. Archaeologists closely estimate these dates using tree-ring analysis on the timbers found in the structures. Following a lunch stop, the tour group leaves the mesa top and descends the trail into the canyon. 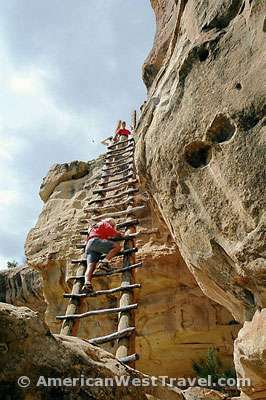 A series of three ladders quickly reaches the narrow ledge at the level of the cliff dwellings, perhaps 100 feet below the mesa top. 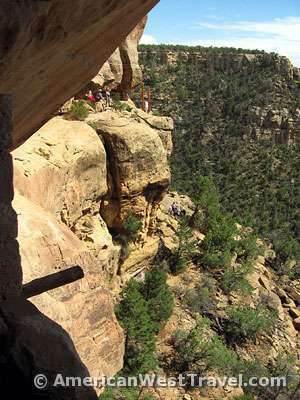 The rough trail follows this ledge to four cliff dwellings: Tree House, Lion House, Morris 5, and the canyon’s highlight, Eagle Nest House. Tree House is just a short walk from the ladders, in a small but lush and heavily wooded side canyon. The highlight is a tower-like structure (photo, left), largely intact and built into the canyon wall. Through the T-shaped door, one can observe that the second floor is still intact. To the left of the area shown in the photo, a kiva and several other rooms are built into a steep overhang. There are many pottery shards around the kiva. The area around the kiva’s fireplace is littered with ancient corn cobs and very old looking bones. A nearby boulder is inscribed by two of the Wetherill brothers with the dates 1888 and 1890. 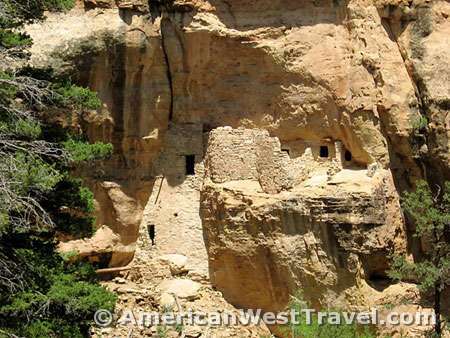 The Wetherills were the first white men to discover the cliff dwellings in the Mesa Verde region. 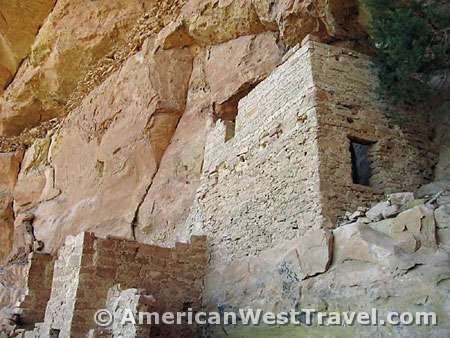 It is said that Acowitz House, the father of the late Ute Chief Jack House (discussed in Part 1) originally led the Wetherills to the Mesa Verde cliff dwellings. Heading down canyon, the next cliff dwelling is Lion House (photo, right). The remnants of the standing walls show a multi-storied building of perhaps three floors. The stub of a wall shown in photo, left, helps substantiate that there were two periods of construction. Note that the masonry style of the upper floor room is quite different than the lower wall. The final Lion House was thought to have 45 rooms and seven kivas. However this would not suggest that 45 families lived here. In fact, all of the sites of the Johnson and Lion Canyon inhabitants were thought to constitute one village of about 200 to 250 people. They were believed to be closely associated with the Mesa Verde people. The next stop is at the Morris 5 cliff dwelling (photo, far left), named for archaeologist, Earl H. Morris, who performed the first professional work in Lion Canyon in 1913 and 1915. The few remaining walls show at least two levels of buildings. Note high up in the alcove (see inset, left) there is a long low structure which could have been a storage area. Apparently, the cliff dwelling was abandoned before this wall was plastered. Yet the loose rocks have remained in place, undisturbed up in the alcove all these centuries. Morris 5 also features an excavated kiva (photo, right) which is well preserved. The support beams for the cribbed roof still sit on the intact stone pilasters. The cross beams have fallen into the kiva. Part of the original roof remains intact in the corner where the kiva meets the wall. Inside the kiva, one can still observe the fire pit and the curved deflector wall which helped ventilate the inside. Some of the original plastering is also visible. The inside walls were covered in white plaster which in turn was brightly decorated. 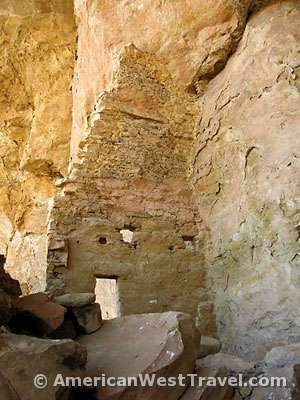 The Morris 5 cliff dwelling was believed to have 25 rooms and 2 kivas. 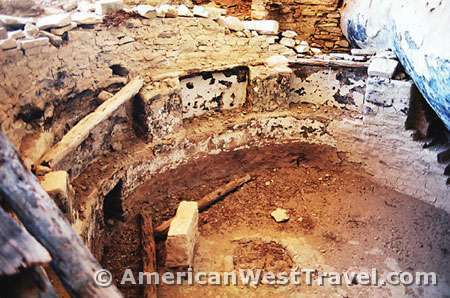 The final and most exciting stop is at the Eagle Nest House, the best preserved ruin in Ute Mountain Tribal Park. The long masonry building (photo, left) is substantially intact. It retains its vigas, a series of poles extending from the wall which originally supported a balcony similar to the one at Balcony House in Mesa Verde National Park. 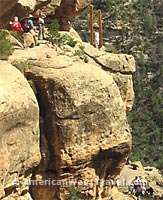 Unlike the other cliff dwellings, Eagle Nest was built against a sheer cliff. Access was gained by footholds carved into the cliff wall. (Photo, Right) Access to Eagle Nest House remains exciting for modern day visitors. To reach the ledge at the level of the alcove, you must ascend a thirty foot ladder from the trail. When climbing, there is canyon wall to your right but open air to your left, a tremendous view if you are not afraid to look. Upon gaining the top, you must walk about 100 feet to the ruin along a four feet wide ledge with a sheer vertical drop and a huge view. Getting on the ladder to go back down is also exciting – you must walk to the edge of the cliff to get onto the ladder. The photo, far right, shows the ladder and access ledge looking out from Eagle Nest House. The photo, near right, gives a closeup where you can see the ladder, people on the ledge, and people at the bottom on the trail. While we visitors had our moment of excitement on the ladder and ledge, it is extraordinary to think how Anasazi men, women, and children adapted to living in this difficult environment on an everyday basis. And there were no protective walls, guard rails, or banisters anywhere out here. There were 15 rooms and one kiva at Eagle Nest House. The kiva (photo, below) has been preserved in exceptional condition. It retains some of its original plaster, and some of the original design work (see closeup below), an extremely rare event. The triangular structures are known as “mountain design”. Guide Gerald Ketchum relates the following story: When archaeologist Earl Morris visited Eagle Nest House circa 1915, he found the kiva with the roof entirely intact! Today, this would be considered an extraordinary find. Yet he found the design work inside the kiva to be even more compelling and desired to photograph it. Because it was too dark inside the kiva to use his camera, he pushed the roof off the kiva and over the cliff! Today, this would be considered a horrifying act of vandalism. Modern archaeologists practice an absolutely minimalist approach in dealing with antiquities. The Ute Mountain Tribal Park tours are highly recommended to anyone who is interested in cliff dwellings or any aspect of Ancestral Pueblo culture. The quality of the experience is similar to Keet Seel in Arizona’s Navajo National Monument, which is generally considered to be the best preserved and most pristine of all Anasazi cliff dwellings. However the hiking and general effort of the all-day tour is quite a bit more strenuous than activities at Mesa Verde National Park. For information on making a tour reservation, please contact the Ute Mountain Tribal Park. (Back to Part 1 – Spectacular Anasazi Cliff Dwellings and Rock Art, Ute Mountain Tribal Park).